Woke to – yes – more gray skies. The larder is a little low and we had the last 2 eggs for breakfast. Left at 11 bound for Sarlat. We successfully navigated the traffic and got into town around 12. Way too crowded, and obviously more tourist-commercial than the last time we were here 4 years ago. 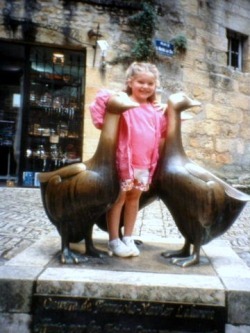 We really just wanted to take Kristen’s picture with the brass geese, just we did when she was 11 months old. Numerous kids by the geese when we arrived, so we went for a “quick” pizza lunch with salads and crepes. Kristen – hot dog and fries. Pizzas not too good. 30€. 1 hour. Took Kristen’s picture with the geese and walked around town looking for the shop Jill had bought Limoges boxes on 2 previous visits – but couldn’t find it. Showed Kristen the Lanterne Des Morts and the gallery where the owner had gushed over her 4 years ago. Then got the hell out of Dodge. South to La Roque Gageac (Kristen slept), and up to Chateau Beynac, where we had the famous Citron Vert incident 4 years ago, and didn’t visit the castle. This time we did visit the castle, arriving at 3 p.m.
Kristen was a nudge with Jill, but Dave had a nice visit. 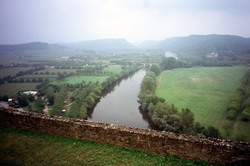 I especially enjoyed the magnificent views up and down the Dordogne River. Took lots of photos, despite gray skies and foggy conditions. At least no rain. The Citron Vert stand no longer existed as we remembered it, but we did have a Citron sorbet and a chocolate, upon exiting. Still good and refreshing, though. Then along the Dordogne valley to St. Cyprien, with nice views, and up to Les Eyzies, home via Rouffignac. All on Michelin “Green” roads. Home, tired, at about 6-6:30. Dinner was a tossup – the ferme-auberge, the “truck stop” restaurant, or the Logis de France in the local dumpy town of Fossmange? Since I only had 35€ left in the wallet, we opted for the Logis de France, figuring it would take Visa. We were the only guests in the dining room, which was very pleasantly furnished but smelled a little old, and a little like the owner’s giant German Shepherd in the lobby. But dinner was actually pretty ok. Maman cooked for us in the back. Dave – vegetable soup, Trout Meuniere, cassis (black currant) sorbet. Jill – salad, steak, citron vert sorbet. Kristen – rice and tomatoes, sausage, sorbet. All served with fried cornmeal dumplings called croquants – Perigord peasant food. With wine, the tab came to 55€, and guess what – Monsieur did not take Visa!!! Despite the fact that he runs a hotel and restaurant. Now I know why they say this region is like southern France used to be 30 years ago. Fortunately Monsieur did take U.S. Dollars, the only thing more universally accepted than Visa. So, we quickly exited, tail between our legs, with apologies. Home at 10, to start packing. This afternoon actually got a little sunny, so maybe a NICE day tomorrow.